War of Will (c) Hodges Photography/Lou Hodges Jr.
War of Will passed his fast-track debut with flying colors on Saturday, emphatically capturing the $200,000 Lecomte (G3) at Fair Grounds by four lengths under Tyler Gaffalione. Tugging a bit when racing three wide just off the leaders down the backside, War of Will made his bid around the far turn, seized control turning for home and won comfortably for owner Gary Barber and trainer Mark Casse. The final time was 1:43.44 for one mile and 70 yards. The 8-5 favorite, War of Will paid $5.20. "I have the utmost respect for this horse. I think he has a chance to be a real superstar," Casse said. "He's got such a tremendous cruising speed." 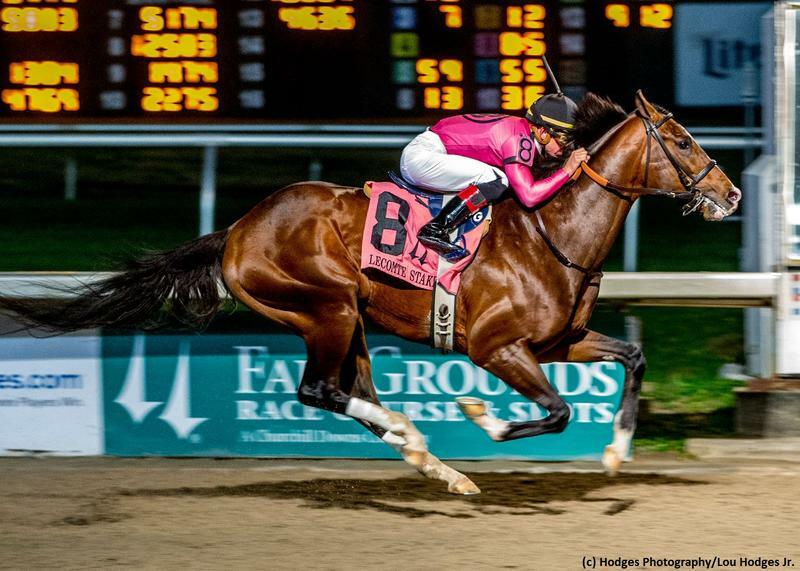 As part of the Road to the Kentucky Derby series, War of Will earned 10 qualifying points for the Run for the Roses. Hog Creek Hustle, Manny Wah, and Wicked Indeed earned points of 4-2-1 for finishing second, third, and fourth, respectively. By War Front and out of the Sadler's Wells mare Visions of Clarity, War of Will stuck to turf for most of his juvenile season. Third in his debut at Woodbine in August, he came to finish a close second in the Summer (G1) over the same course. He was beaten less than a length into fourth in the Bourbon (G3) at Keeneland next out, then finished a credible fifth in the Breeders' Cup Juvenile Turf (G1). Trying dirt for the first time in a 1 1/16-mile maiden on the Stars of Tomorrow II card at Churchill Downs in late November, War of Will romped by five lengths over a sloppy track. He's now earned $251,569. Bred in Kentucky by Flaxman Holdings, War of Will is a half-brother to Group 1 winner Pathfork and multiple stakes winner Tacticus. This is the family of Breeders' Cup Mile (G1) winner Spinning World and champion sprinter Aldebaran.